Hello everyone! Well, we have made it (almost – 12 hours and counting!) through another year, but before we say goodbye to 2013, there is one last night to live it up in Big Bear Lake. Here is an Events Flyer (courtesy of BigBear.com) with the details of tonight’s festivities. A friendly reminder from RS Vacations: Please celebrate responsibly – Don’t drink and drive. Well, it may not have been a White Christmas here in Big Bear Lake, but it was beautiful nonetheless. Lovely, fair weather continues this week and into New Years with temperatures perfect for skiing and boarding, tubing or just wandering around The Village. Night Tubing is back at SnowPlay at the Alpine Slide and Snow Summit has night session every night until January 4th. 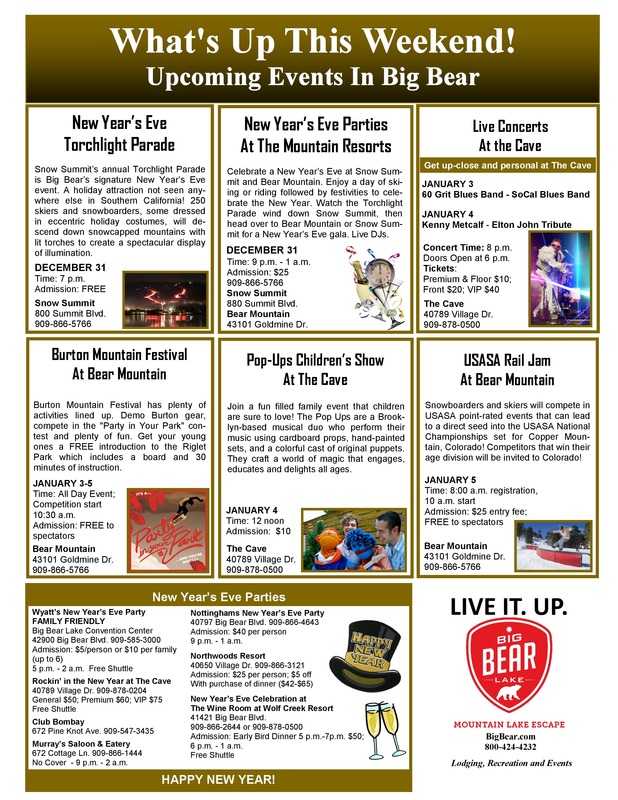 New Year’s Eve is coming up fast and Big Bear has multiple ways to enjoy ringing in the New Year. There are parties at several restaurants and clubs around town as well as at both Snow Summit and Bear Mountain. And don’t miss the Annual Torchlight Parade that winds down the runs at Snow Summit – it starts at 7:00 PM on the 31st. Dec 31, 2013; 7 p.m. – 8:30 p.m.
After a terrific day on the slopes on New Year’s Eve, guest will be treated to a torchlight parade at 7 p.m. followed up by Summit’s New Year Eve Party starting at 8 p.m. The Torchlight Parade is a spectacular sight to see as 100 skiers and snowboarders carry torches down Miracle Mile to weave a mysterious path of light to ring in the New Year; the show is free to spectators. Shortly following is the New Year’s Eve Party (see below). Dec 31, 2013; doors open 5 p.m.- 2 a.m. Admission: $5/person or $10/family (up to 6) and includes party favors, FREE champagne toast and complimentary shuttle rides home! “Big Bear’s Only Family New Year’s Celebration!” Join us for New Year’s Eve at Wyatt’s for live music by DJ Joe and Dawson’s Gang (One of SoCal’s Top Country Bands), bounce house, children’s arts and crafts, complimentary shuttle and champagne at 12 midnight and much more. Click here for more information. For more information call (909) 585-3000. Sells out early! Pre-purchase tickets at Robinhood Resort or Nottinghams Restaurant or call (909) 866-4643. Join us for dinner to enjoy our special New Year’s Eve menu! Dec 31, 2013; 8 p.m.- 1 a.m.
New Year’s Eve Party featuring DJ Desi, Party Favors, and hors d’oeuvres (21 or older with valid ID). Dec 31, 2013; 9 p.m.- 1 a.m. Admission: $35/person includes appetizers and party favors (21 and over). Keep the excitement going after a day on the snow by bringing in the New Year with live music, food, and much more! 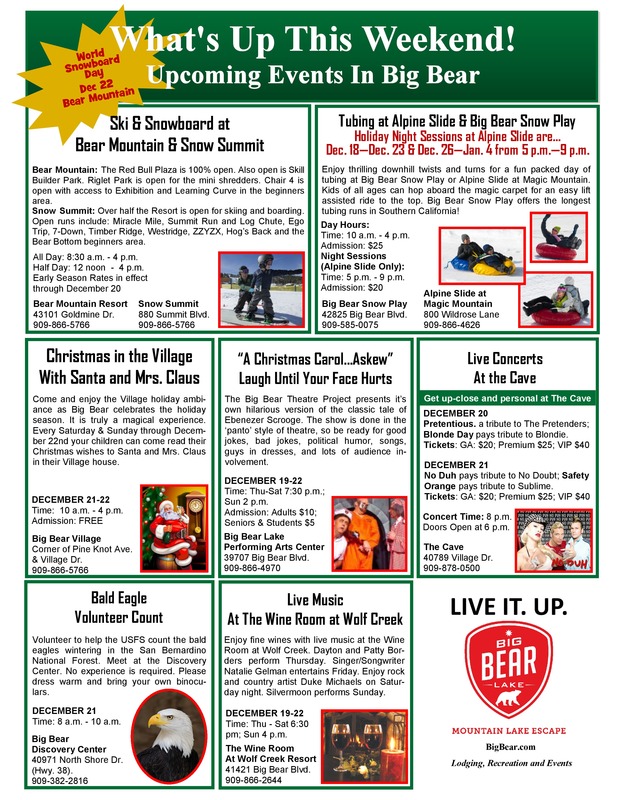 Bear Mountain Party begins at 9 p.m.
Dec 31, 2013; 6 p.m.- 1 a.m. Menu: Prime rib, salmon, or chicken cordon bleu paired with potato or veggie salad, bread, dessert and champagne. Come ring in the New Year with us at the Wine Room at Wolf Creek Resort! The Real Jazz Trio Cool will perform jazz from 5 p.m.- 7 p.m. and dance to Old Time Rock ‘n Roll 8 p.m.- 12 midnight. Courtesy shuttles available (weather permitting and based on availability), photo booth, party favors and more. Call (909) 866-8705 to purchase your tickets. 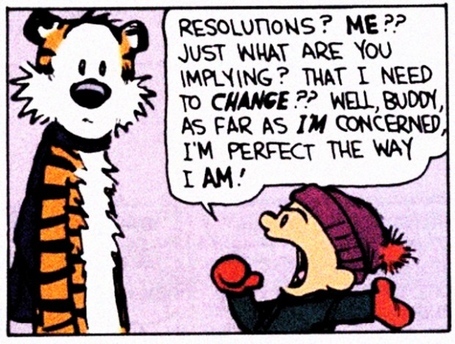 The Cave will be “Rockin’ in the New Year” 2014! Come ring in the New Year with us at this DON’T miss event! Tickets include champagne toast, party favors, appetizers, photos, dancing and LIVE entertainment! Call (909) 878-0204 for tickets and information. Join Northwoods Resort for the party of the year! Make your reservations now, it will sell out (909) 866-3121. Snow Summit’s annual torchlight parade is Big Bear’s signature New Year’s Eve event, a holiday attraction not seen anywhere else in Southern California! The mountain resort is only a two hour drive from most Southern California communities and is a great escape from the norm. Monday, December 31 at 7 p.m. 250 skiers and snowboarders, some dressed in eccentric holiday costumes, will descend down snow capped mountains with lit torches to create a spectacular display of illumination. The free event can be seen from a range of vantage points throughout Big Bear. Besides the torchlight parade, Big Bear has a variety of recreational activities happening after the sun goes down including night-session skiing at Snow Summit and inner tubing under-the-lights at Alpine Slide at Magic Mountain. Festive celebrations happening throughout the valley include distinctive holiday menus, special musical guests, and reasonable admission charges. Wyatt’s at the Big Bear Lake Convention Center and Nottinghams Restaurant all plan to bring down the house this New Year’s Eve with a bang! Snow Summit is open for night skiing from 3 p.m. to 9:30 p.m., with a brief interruption of course for the torchlight parade. Celebrations at both ski resorts begin, after the impressive parade ends. Snow Summit is known for its fun filled evening of dancing and good times that goes well into the night with a DJ spinning high-energy music. The celebration begins at 8 p.m. and goes to 1 p.m. The cover charge is $35 and includes party favors and light appetizers. Bear Mountain offers a more edgy festivity with DJ’s spinning modern rock and hip hop music. Bear Mountain’s New Years Eve celebration starts at 9 p.m. and end at 1 a.m. The cover charge is $35 and includes heavy appetizers. Guests must be 21 years or older and reservations are recommended for all Big Bear New Year’s Eve celebrations. Can’t find lodging for New Years Eve and to learn more about New Year’s Eve in Big Bear call 800-424-4232. May you have a blessed day filled with family, friends and joy!! 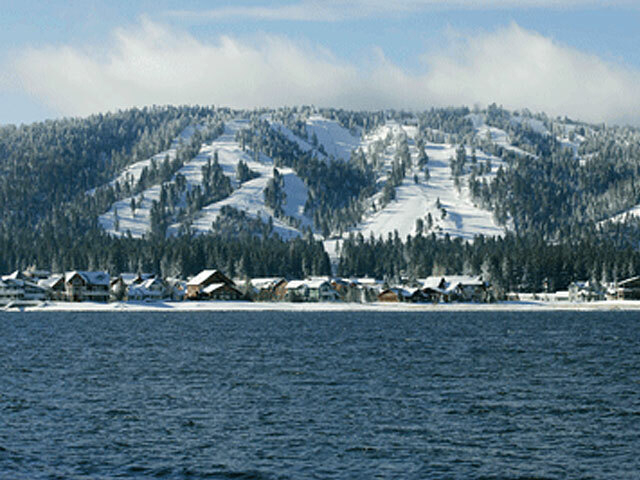 Wondering what there is to do Christmas Week here in Big Bear Lake? Plenty! Following is a list of activities along with hours of operation for the holiday week. Also included is a list of restaurants and their hours for Christmas Eve and Day. If you really want to add sparkle to your holiday season there is no better place in Southern California than Big Bear Lake. From Christmas to New Years the cozy mountain town transforms into a magical place of yule-tide cheer! Alpine Slide: Christmas Eve, 10 a.m. – 5 p.m. (weather permitting); Christmas Day, 11 a.m. – 4 p.m. Night sessions Dec. 13 – Dec. 23 & Dec. 26 – Jan. 4, 2014: night sessions 5 p.m. – 9 p.m. for $20 per person. 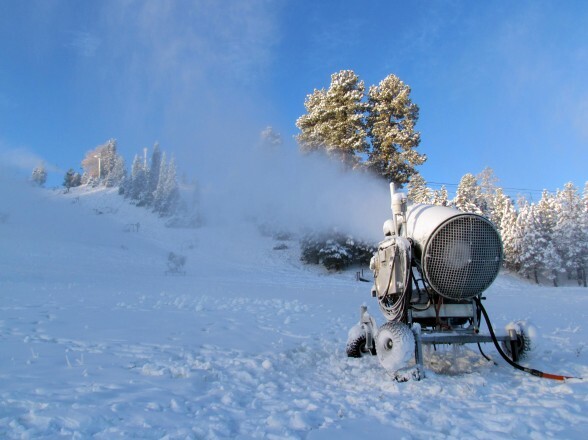 Big Bear Snow Play: Christmas Eve, 10 a.m.- 4 p.m.; Christmas Day, 11 a.m.- 4 p.m. Bowling Barn: Christmas Eve, 10 a.m.- 5 p.m.; Christmas Day, 12 noon -10 p.m.
Big Bear Alpine Zoo: Christmas Eve, 10 a.m.- 5 p.m.; Christmas Day, CLOSED. Snow Summit: Christmas Eve & Christmas Day, Day Session* 8 a.m.- 5 p.m.; Night Session 3 p.m.- 9:30 p.m. (weather permitting). *Day Session extends to 6 p.m. when Night Session is offered. Bear Mountain Ski Resort: Christmas Eve & Christmas Day 8 a.m. – 4:30 pm. Helicopter Big Bear: Christmas Eve & Christmas Day Open, call for reservations (909) 585-1200. Gallery of the American Landscape: Christmas Eve, 10 a.m.- 6 p.m.; Christmas Day, CLOSED. 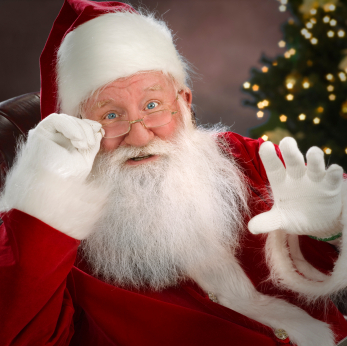 Big Bear Discovery Center: Christmas Eve, 8:30 a.m. –2 p.m.; Christmas day, CLOSED. Monday, Dec. 26, Federal Holiday, CLOSED; Tuesday Dec. 27 & Wednesday Dec. 28: CLOSED. Altitudes Massage: Christmas 8 a.m. – 9 p.m.
Miss Liberty Paddlewheel Tour Boat: Christmas Eve and Christmas day Open, call for reservations and dependent on interest. Action Zipline Tours: Christmas Eve & Christmas Day tours start at 9 a.m., 11 a.m. and 2 p.m.
Action Segway Tours: Christmas Eve & Christmas Day tours start at 10 a.m. and 1 p.m.
Goldsmith’s Board House: Christmas Eve and Christmas Day, 7 a.m – 10 p.m.
IT’S SNOWING! 🙂 Snow began to fly in Big Bear a couple of hours ago and it is looking very white outside. Perfect timing!! Check out the forecast below. 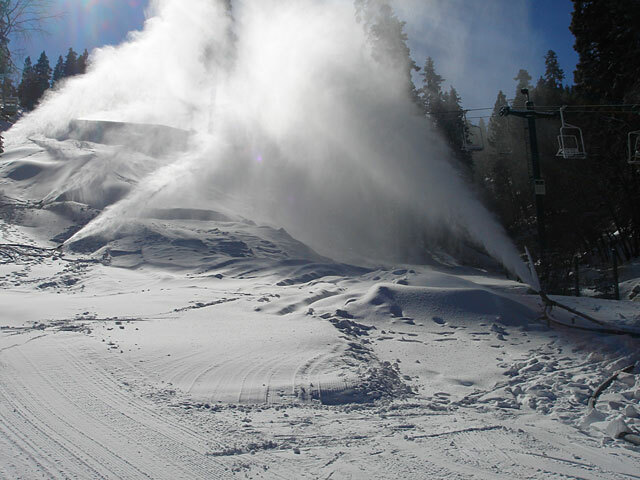 There is a lot to do this coming week in Big Bear Lake and the Skiing and Boarding are GREAT and getting better by the minute! We do have a few homes left for the Holidays. Visit RSVacations.net and book a Big Bear Cabin for Christmas or New Years. Don’t wait, they’re almost all gone!! The snow is coming, the slopes are open, so book today at RSVacations.net! Some Disclaimers: Although I try to be as accurate as I can, there could be some mistakes here. Nights available and nightly rates are not guaranteed until booked. The first date listed in a range is available for check-ins, the second date is available for check outs. This information is up to date as of 12/16/13 at 9:00 AM. Please visit our website at RSVacations.net for more details or to book online.